The Colours Of The Night is the new album from ‘writer-songsinger’ Pete Atkin, released on 6th July on the Hillside Music label. 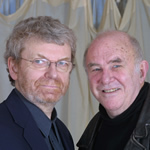 Its thirteen tracks mark the final chapter in a songwriting partnership with Australian broadcaster and poet Clive James that has endured for almost fifty years. Clive said, "It doesn't matter what category our songs fall into, as long as people listen. The trick is to make sure nothing gets between the songs and the listeners." Subject matter includes immortality (‘We Will Love Again’), change (‘The Beautiful Changes’), obsession (‘The Closer Someone Is’), divorce (‘Time To Burn’), survival (‘The Colours of The Night’ and ‘Last Ditch’), shortness of breath (‘Slow Down For Me’), long distance love (‘The Way You Are With Me’) and mortality on ‘You Better Face It, Boy’, one of the first songs Clive and Pete ever wrote together. Pete and Clive approached publishers in the first instance, not record companies, and it was a publisher who funded the recordings, intended mainly as demos, which eventually became Pete’s first album, ‘Beware of the Beautiful Stranger’, released in 1970 on the Fontana label. CLIVE: Love gone wrong was a favourite theme of the 16th Century English poets, partly because there was an automatic sadness to it, making the songs sound good on the lute. The basic concept is that the lover, by immortalising the loved one, was also immortalising himself. It was a delusion that no doubt came in handy if you were a poet languishing on the fringe of the court, with even less pull than the lute-players. PETE: Clive never told me about the lute idea, but I don't think I'd have taken that as a cue anyway. I've always found a benefit in sometimes taking a lyric in an unexpected musical direction, in the same way that I've always liked songs that seem to say one thing while seeming to mean something else. That's one of the things music makes possible sometimes. CLIVE: “The Way You Are With Me” is a lyric written from the viewpoint of the Flying Dutchman, as so many of my lyrics and poems are. The Dutchman finds the woman who will redeem him, but she turns out to be imaginary. The Muse is always imaginary, even when she exists. PETE: At first I couldn't settle on how to approach this one musically. Clive's first draft (originally called "Night Surfing Blues") didn't have a middle eight, but when he added one, it seemed to open up the whole song. Those gulls flying into the daylight helped it all to fall into place for me. PETE: This has been recorded before, but not by me (except for a demo version on a rare 2002 compilation album). I wrote it originally with an insistent triplet rhythm, which is how Julie Covington did it (stunningly) in her 1970 version, but I've now evened out the rhythm, partly no doubt because I couldn't begin to compete with Julie. Clive has said that he has "made it a rule never to use unacknowledged a phrase that was not my own", and I know he has always been uneasy about having borrowed the phrase The Beautiful Changes from the great American poet Richard Wilbur, to the point of wishing he'd given the song a different title. But I'm afraid it's too late for that. Besides, Wilbur uses the phrase only as a title, and you can't copyright a title. Nevertheless, here is acknowledgement, in hopes that it will make Clive's scrupulousness a bit less uncomfortable for him. CLIVE: I’m sorry now I ever tried to steal the title for “The Beautiful Changes” from its rightful owner, Richard Wilbur. What was I expecting, that his beautiful early poems would go away? Anyhow, the astronaut never did go to Mars. CLIVE: “Time to Burn” is the story of an amiable divorce. Even if you never have the divorce, you get to treasure the amiability. CLIVE: “The Closer Someone Is” is yet another version of the Muse story. She must be a sturdy creature, to survive all that adulation. PETE: Yup, the man who walked toward the music is still walking, just not quite as quickly as before. It's pretty obvious, I hope, that this is a musical love song – that's to say a love song to the music – and I'm especially grateful to Clive for giving me this opportunity to indulge myself. I have to concede, of course, that the kind of music the girl is listening to is probably not the sort of thing I'm referencing here, but I hope I can justify myself by saying that in any case it's all in the imagination of the bloke who's singing the song, like so much else. CLIVE: “Nothing Can Touch Us Now” is a variation on the favourite nineteenth century romantic theme of the two lovers escaping together. The theme reached its early peak in that great line by Keats from The Eve of St Agnes: “These lovers fled away into the storm.” And they did it without credit cards. CLIVE: The ageing poet is bound to end up as a rejected suitor, but he tries to welcome his defeat as a supply of fresh material. There’s an irony in the title, “I Know the Way”. He doesn’t know anything. PETE: This song was due to have been included on what would have been my seventh commercial album in 1977 if I'd made it. It slipped between the cracks again twenty years later when I put down a collection of previously unrecorded songs (The Lakeside Sessions - Hillside HILLCD01/02). It seemed to me that the darkness in the lyric might be helped by an innocent-seeming tune – just as the snake's name makes it sound much less deadly than it actually is. It was Chris Spedding himself who suggested the slide guitar. It too seems symbolically appropriate. CLIVE: I wrote the lyric of “Cottonmouth” a long time ago, looking ahead. Nevertheless it’s among the more deeply autobiographical of my lyrics, which are nearly all made up. But I really was, or so I supposed, the talker who had to change countries because he couldn’t stop talking. PETE: Clive is fond of introducing any of our older songs as "one of the first songs we ever wrote", but this one really is, and we can prove it by its inclusion on a privately-pressed vinyl LP of home-made recordings that we put together in 1967 when we were still students. Without that knowledge, you might perhaps be tempted to guess that it's a recent lyric, but Clive was actually twenty seven years old when he wrote it. CLIVE: This is another song that’s been around for ages but has latterly come into its own as the author of the lyric faces the final curtain. What was once fanciful becomes apt. Sic transit Gloria Swanson, as they say in Hollywood. CLIVE: “The Colours of the Night” and “Last Ditch” are the same lyric, but for different songs. Both are military anthems, but one is to be sung on the march and the other, much more sadly, around the camp-fire. It’s not a theme that I would usually choose, but sometimes it chooses me, on those sad days when I fear the war will never end. PETE: "Last Ditch" presents the positive face of "The Colours Of The Night", with Jon Trenchard's irrepressible piccolo impersonating the more traditional fife as we march defiantly from the battlefield – for the time being anyway. PETE: Any discussion of clever rhyming always gets people quoting examples of outrageous, inventive, tricksy rhymes, but the sheer skill of Clive's rhyming here for me trumps any kind of clever-cleverness. We've always had a fondness for free-form, out-of-tempo introductory verses, and this is another, except that this one doesn't have the in-tempo chorus to follow it. In fact, it doesn't have anything to follow it.